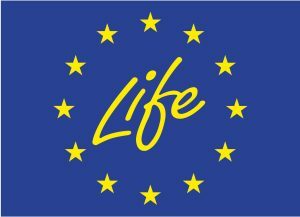 The latest blow to the planned 68 megawatt Boškov Most hydropower plant, a highly controversial project that has attracted EUR 65 million in financing from the European Bank for Reconstruction and Development (EBRD), was dealt in early December by the Standing Committee of the Bern Convention, the European wildlife treaty. In a new recommendation, the Convention’s committee called on the Macedonian government to suspend its plans for establishing over 20 hydropower facilities – including Boškov Most – in the Mavrovo National Park until a strategic environmental assessment (SEA), analysing potential impacts, is completed. A member of the endangered Balkan Lynx community in Mavrovo National Park. Photo: Dime Melovski. 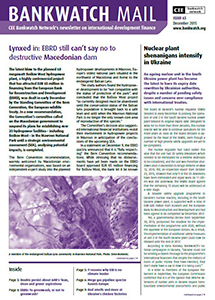 The Bern Convention recommendation, warmly welcomed by Macedonian environmental organisations, was based on an independent expert study into the planned hydropower developments in Mavrovo, Europe’s oldest national park situated in the northwest of Macedonia and home to the endangered Balkan Lynx. The Committee’s decision also suggested international financial institutions revisit their involvement in hydropower projects in Mavrovo in anticipation of the conclusions of the upcoming SEA. A wave of hydropower development fuelled by European public funding and EU companies is endangering pristine river environments in the Balkans. For five years now, Macedonian environmental organisations have raised their voices against planned hydropower plants in the Mavrovo National Park. They have repeatedly insisted that hydro dams in national parks result in the destruction of habitats and species, that they cannot contribute to nature conservation and, therefore, should be avoided. However, the Macedonian government has been vigorous in its support of such energy developments and set out early to involve the EBRD in this roller coaster. 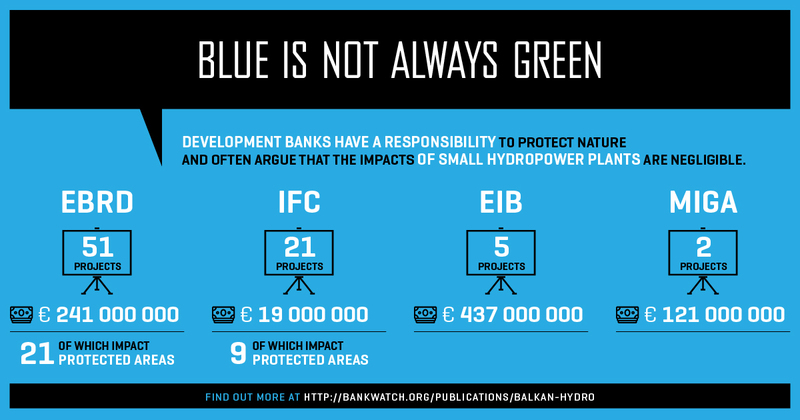 In 2011, therefore, the EBRD approved a EUR 65 million loan for the Boškov Most hydro power project. The bank soon found out, if it had not known before, that the area of the planned dam is the core reproductive area of the fragile Balkan Lynx population. The EBRD doubtless gulped a bit more when the highly respected International Union for Conservation of Nature confirmed that the population of the Balkan Lynx is officially considered to be critically endangered – there are less than 40 individuals of this species left in the wild. To date, fortunately, no project construction has started as the EBRD was knuckle-rapped by its own complaints mechanism that it had failed to comply with its policies when deciding to finance a project in a critical habitat. As a result of the expert report from the EBRD complaints mechanism, more studies are in motion to assess whether Boškov Most is, yes, worth the sacrifice of the Mavrovo National Park. Last year, the project cost estimates jumped three times as the dam was estimated to cost around EUR 150 million and, if the EBRD is seriously considering further support, its Board of Directors would need to sign off on a new loan for the 68MW plant. The SEA is expected to take another year, thus adding another two commitment fee tranches paid to the EBRD by Macedonian citizens, who neither want nature destruction nor getting poorer. In the four years since the signing of the Boškov Most project loan, ‘commitment fees’ paid to the EBRD by the Macedonian government have reached EUR 1,950,000. Great work if you can get it. But why, given the scale of recklessness from all sides?